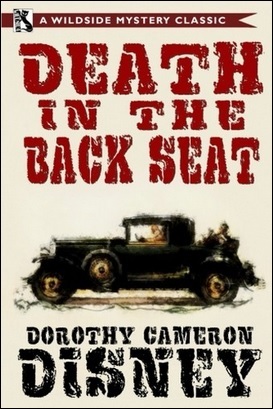 "It's a cinch he didn't climb into our rumble seat to make it simple for his murderer." 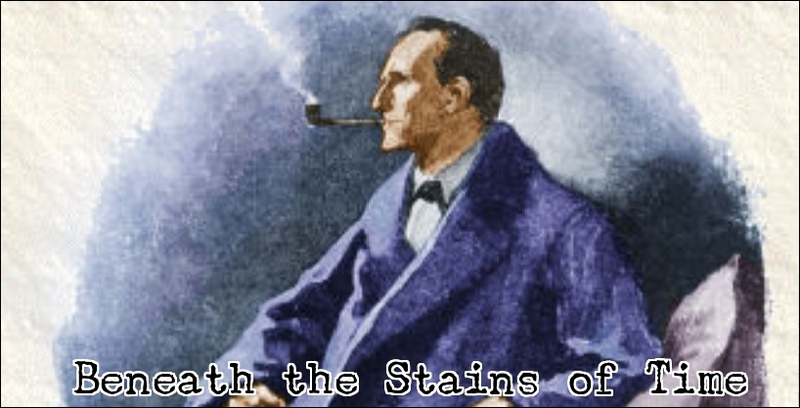 One of the detective story's most famous admirers was T.S. Eliot, poet, playwright and critic, who reviewed mystery novels in the Criterion and was among the first to recognize the genre was entering a Golden Age in the 1920s, but also compiled some "general rules of detective technique" in 1927 – preceding both S.S. van Dine's Twenty Rules for Writing Detective Stories (1928) and Father Knox's Ten Commandments for Detective Fiction (1929). So you would expect Eliot to have followed in the footsteps of A.A. Milne and T.H. White, but it was his older brother, Henry Ware Eliot, who penned a one-off mystery novel. Henry Ware Eliot, Jr. was a Research Fellow in Near Eastern Archaeology at the Peabody Museum, Harvard, where he worked on Excavations in Mesopotamia and Western Iran: Sites of 4000-500 B.C. : Graphic Analysis (1950). A "labor of love" that was published posthumously, but twenty years previously, Eliot wrote a novel already showing the "devotion to detail" one expects from an academic researcher. Sadly, the book in question was buried in the sands of time and lay there completely forgotten by the world until a couple of months ago. The Rumble Murders (1932) was originally published under a pseudonym, namely "Mason Deal," but Coachwhip has reissued the book under Eliot's own name and comes with an introduction by Curt Evans and a special afterword by David Chinitz – which briefly looks at T.S. Eliot's affection for the detective story. So this new edition is book-ended with some insightful material, but is it one of those unjustly forgotten detective novels worthy of resurrection? I would say yes. The Rumble Murders is one of those fun, high-spirited amateur affairs with a group of friends, or acquaintances, assuming the role of detective and crawl all over the place for clues. One of the detectives in Eliot's yarn is an author, George Palmerston Gaynleigh, who is down to "three dollars and fifteen cents" and Ed Marsh's "invitation had come in the nick of time." Marsh is part of a syndicate who had taken over the village of Beesonville and turned the place into a suburban neighborhood, which is now known as Westwood. Recently, Marsh converted his barn into a guesthouse and George is one of the people who's supposed to fill the place. A retired private detective, named Gil Hubert, is the other one. But then the first of many problems began to manifest itself. After a fire damaged the previous barn, Marsh converted the silo, attached to the barn, into a fire-and thief proof storage for his rare books, manuscripts and firearms, but a burglar managed to penetrate the tower-like structure and take away one of the handguns – a Colt Model 1917 from the First World War. Suddenly, everyone looks as if they're acting mighty suspiciously and someone even seems to have taken flight. On the heels of these events, the news reaches the small suburb about what became to be sensationally known as the "Rumble Murder Case." In a neighboring town, six or eight miles from Westwood, the body of a man was found in the closed rumble of the car belonging to a wealthy resident, J. Clopendyke Clifford, who made the discovery upon his return home. The unknown man had been shot through the head and stripped of most of his clothes. A suitcase that was in the rumble seat has gone missing. Shortly upon this discovery, "a second victim of the rumble murderer" is found "jammed into the closed rumble of a car submerged in Lake Putnam." Once again, the victim was shot through the head and stripped of clothing, but this time the victim is quickly identified. So the neighborhood "Homicide Squad" have their work cut out for them. As others have noted, Eliot had an eye for detail and this allowed him to construct a complicated mesh-work of crossed plot-strands, which includes ballistics, obtaining fingerprints, a cryptogram, golden dollars and long-forgotten family secrets. But he also knew how to write memorable set pieces. The backdrop of the book comes across as a very real place with its own history, recognizable landmarks (e.g. the hand-shaped tree) and the traces left behind on its landscape by the people who have lived there. One scene has Hubert, Ed and Mike tramping alone the ravine to get to the base of the cliff where a "junked car" lay, but what they found was a boneyard of scattered, rusted-out old automobiles – all of them "in an extreme condition of wreckage." A nice little to imagine to modern readers, I thought. I also appreciated the long-lost cemetery on the hill with its missing headstones and a looted grave, which turned out to play a key role in the double murder case. So all of the plot-strands are closely tied to this place and the history attached to it, but what is all the more enjoyable are the activity of characters tramping about this place. Not only do they discuss and theorize about the possibilities the evidence suggest, but they also actively hunt for physical evidence. Such as gathering fingerprints and trying to find a tree that was once used for target practice, which would allow the police to determine whether the stolen revolver was used to kill one or either of the rumble murders. I closely associate this kind of enthusiastic and animated teamwork among a cast of befriended characters with the detective fiction by Craig Rice, but one point where Eliot differed from Rice is that his plot was not fueled by an ungodly amount of hard liquor. Otherwise, I found them both equally entertaining, if for different reasons. However, I have one complaint. 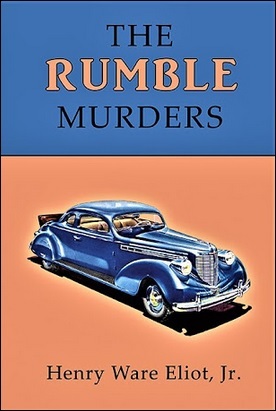 Not one that deterred my overall enjoyment of The Rumble Murders, but one that should be mentioned. Eliot crafted a delightfully complex case that perfectly fitted together in the end, but the only smudge on this accomplishment is that some important pieces of information were given relatively late in the game. And this will seriously hamper the armchair detective to arrive at the solution before the ending. You can (sort of) figure out the whole picture at the eleventh hour, but there aren't that many pages between the last pieces of information and the revelation of the truth. So you might want to take a break when you arrive at chapter XXVII and ponder the problem before reading the last ten pages of the story. The Rumble Murders has also been reviewed by Kate over at Cross Examining Crime and Curt Evans briefly discussed the book on his blog. On a final, semi-related note: years ago, I reviewed Dorothy Cameron Disney's excellent Death in the Back Seat, 1936), which also focuses on a murdered man found shot to death in the rumble seat of a car. The book has been reprinted since then and some of you might want to read it as comparison material. Thanks for the mention. I too had some qualms about the last minute information, but overall really enjoyed the story. Interested to hear of the Disney novel using a similar device. Disney defied what you'd expect from that name today and is one of those authors who deserves to be better known. Death in the Back Seat is excellent, perhaps even better than The Rumble Murders, but she also wrote the superb The Strawstack Murders. The quality of these two titles make for a good excuse to bloat your wish list. Thanks for the review. This one sounds interesting. As far as what happens when the author gives important information late in the story, this does not bother me and seems to me to be a legitimate technique to obfuscate the reader. As long as I figure out who the murderer is prior to the big reveal, I count it in my winning column. Personally, I think these very late revelations of key pieces of information betray a lack of confidence on the authors in part in his own plotting ability. Technically, they still count as fair play mysteries, because you can figure it out before the big reveal. However, it's not as impressive as when all of the tell-tale clues had been given well before arriving at the big reveal. Agree about Disney, and she's available now on Kindle. Rumble is a fun book, I think, such joie de mort.